“Basically, it’s a bruised brain,” said Penn Manor School Nurse, Anne Butterfield. A concussion is a type of traumatic brain injury that is caused by a fall or another injury that jars or shakes the brain inside the skull. Although there may be cuts or bruises on the head or face, there may be no other visible signs of a brain injury, according to WebMD. Causes of concussions vary, including: fights, falls, playground injuries, car crashes and bike accidents. Concussions can also happen while participating in any sport or activity such as football, boxing, hockey, soccer or even cheerleading. A new bill going through the state legislature will set specific requirements for coaches if any athletes suffer head injuries. The bill, known as the Safety in Youth Sports Act, also increases the awareness and prevention of head injuries among athletes in school-sponsored athletics. The bill requires students showing symptoms of a concussion to be sidelined and kept from participating in games, competitions, scrimmages and practices until cleared by a doctor. It also requires students and their parents to review information regarding the risk of head injuries and concussions and sign an information sheet every year before participating in scholastic sports activities, and requires coaches to be trained in the risk of brain injury in sports. High school junior and varsity cheerleader Mackzenie Payne could be labeled as the queen of concussions. Payne is still recovering from her most recent. Payne’s concussions weren’t just a bump on the head, she has experienced some fairly traumatic situations. Not all of Payne’s concussions were due to cheerleading. Two of them were other accidents, one in a car and another on a four-wheeler. It is not always easy to know if someone has a concussion. A person doesn’t have to pass out (lose consciousness) to have a concussion. Symptoms of concussions include: thinking and remembering, physical discomfort, changes in emotion and sleeping habits. People with concussions have problems thinking clearly, concentrating and sometimes problems remembering the event in which it happened. 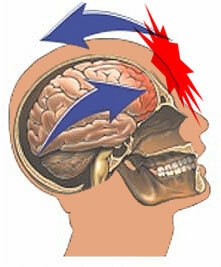 Symptoms of a concussion range from mild to severe and can last for hours, days, weeks or even months. Weber experienced his first and only concussion in August 2010 when former Penn Manor graduate Garrett Young tackled him, forcing Weber’s neck to go backwards, clenching his teeth together. People with concussions are prone to very strong headaches, dizziness and nausea. People are usually very emotional and frustrated and tired. When people get concussions their sleeping habits change a lot and they sleep either more than usual or not at all. For young people, ages 15 to 24 years, sports are the second leading cause of traumatic brain injury behind only motor vehicle crashes. “I was concussed,” said Weber.